Aretha Franklin will be forever known as The Queen Of Soul and one of the original classic soul pioneers like Ray Charles, Otis Redding and Wilson Pickett who had a knack of mastering funk grooves drenched in gospel, soul, rock and pop. Aretha Franklin created some of the greatest sides ever for Atlantic, where she spent almost two decades creating some of the most masterful and beautiful soul music ever waxed. In 1969, Aretha was honored with her first greatest hits collection by our good friends at Atlantic Records simply titled Aretha's Gold. This stunning array of her biggest #1's and other smash hit singles, most of them featuring Duane Allman, Arif Mardin, Jerry Wexler, Tom Dowd, Roger Hawkins, Spooner Oldham and Jimmy Johnson, dominated the top of the soul and pop charts for over a year. Her songs and soulful delivery on these hits truly illustrate how important her force was then and still is today, over four decades since! Aretha was important in bridging all types of rhythm and blues music to a much wider audience, churning out notonly soul smashes but pop masterpieces. Most of her biggest hits have been covered by many artists over the years aswell. 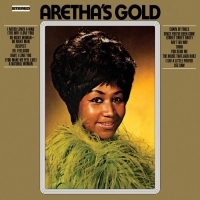 Jam packed with the original Atlantic recordings of solid senders like her classics Chain of Fools, See Saw, Baby, I Love You and of course Respect, Aretha's Gold is virtually an encyclopedia of SOUL ! Even more soul and pop classics abound as you'll hear her scream and shout with the best of the blues with Dr. Feelgood, one of her most beautiful ballads with (You Make Me Feel Like) A Natural Woman, and her soulful touch on Burt Bacharach's classic I Say a Little Prayer. This #1 charting 1969 LP hasn't been available on vinyl for many decades...that is until now !